Today we’ll show you how to grow onions in pots! Onions are the perfect vegetables to grow at home since they’re used in so many dishes, and could save you hundreds of dollars in the end. Onions grow well and they don’t need a lot of pampering, so let’s see how to grow onions in pots (or in the garden as well!). 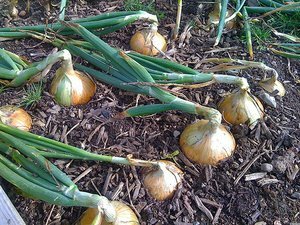 Onions are a cold season crop, and therefore are easy to grow because of their hardiness. We strongly recommend using onion sets because they’ll have a much higher success rate than planting from seeds or transplants. Also, onion sets are very frost resistant, so there is no worry leaving them out in case of a cold front. Place your pot in a sunny location, where your onion plants won’t be obstructed by other plants or shade. Choose a big pot with good drainage. The soil will need to be well-drained, loose, and rich in nitrogen. 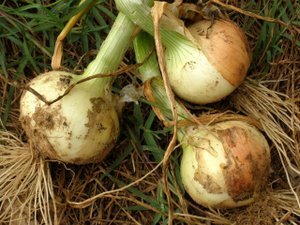 Before planting your onions, work in aged manure or fertilizer. Onions are heavy feeders, and if well fed, will grow big bulbs. When it’s time to plant, mix in some nitrogen fertilizer, and side dress every few weeks until bulbing begins. 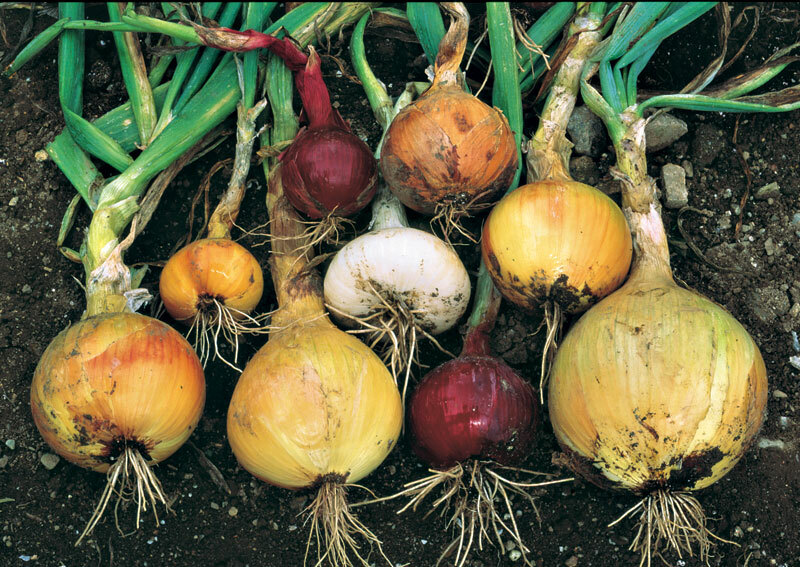 Plant your onions in early spring, as soon as the last frost is over, usually in late March or April. 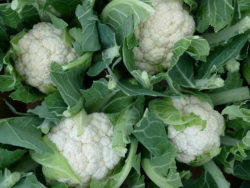 Plant the smaller sets 1 inch deep into the soil, and 4-5 inches between each plant. Each row should be 12-18 inches apart. Every few weeks, fertilize with nitrogen in order to get big bulbs. Stop fertilizing once the onions push the soil away and the bulbing process has begun. Do not put soil back around the bulb once it has grown – the bulb needs to emerge above the soil. Cover the area which mulch to retain moisture. Remove any onions that have sprung flower stalks. This means that the onion has bolted and is done. Onions will become mature once the tops become yellow and begin to fall over. At this point, you can bend the tops down to speed the ripening time. Loosen the soil around the bulb to encourage drying. After a few days, turn them up and let them cure on dry ground. Make sure to handle the onions carefully as the smallest bruise can encourage rot. Once the tops are brown, pull the onions. Allow the bulbs to dry for a few weeks before storing them in a cool, dry place. Do not store with apples or potatoes. How to Grow Onions in Pots was last modified: November 2nd, 2017 by Aniela M.